Getting up to speed. That’s what the New Jersey Devils and the rest of the NHL finds itself doing in this early abbreviated season. In some ways one could tell which players have been going full force from late September in other leagues and those attempting to find their stride. Although when players around the age of 40 (Jaromir Jagr, Teemu Selanne, Martin St. Louis, Ray Whitney) are lighting it up like it’s the lockout shortened season of 1995, I supposed “up to speed” is up to interpretation. So as the home opener looms for the Devils, some of those questions regarding who was going to step up, were answered. Albeit one game at the New York Islanders is a small sample size but the players with heightened expectations, appeared to step it up for New Jersey. Buzzing around the ice from the start was Mattias Tedenby. The young Swedish forward had a pep in his step and it appears as though 30 games with the AHL Albany Devils has only served to help his development. Tedenby had some brilliant opportunities early, only to be thwarted by the brilliance of Isles stopper Evgeni Nabokov. 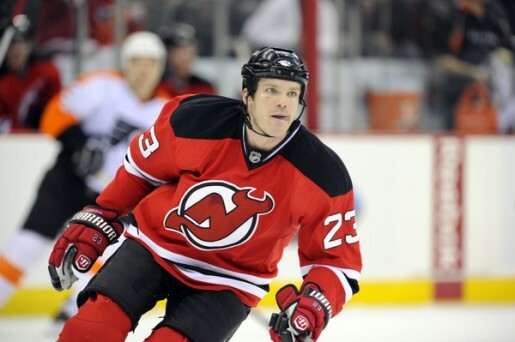 It was also Tedenby who along with Patrik Elias, picked up the secondary assist on David Clarkson’s eventual 2-1 winner. Encouraging play to say the least from Tedenby, who left the “A” on a high note with goals in each of his last four contests. Another player who was clearly on the mark, Ilya Kovalchuk. Much like the aforementioned Tedenby, it was apparent that Kovalchuk was in mid-season form, from having played 36 games with KHL St. Petersburg SKA. Kovalchuk had his opportunities but also found himself stymied by his countryman Nabokov. Yet Kovalchuk displayed that familiar touch, sending the saucer over a sprawled out Mark Streit, connecting with Travis Zajac for New Jersey’s first goal of 2013. Speaking of the two Devils goal scorers, Zajac, who cashed in with his checkbook, made a statement that he seems ready to make good on that deal. Also showing his 30-goal campaign of a season ago was hardly a fluke, was Clarkson. Seeing as how these two players in particular are expected to pick up the slack, that kind of start goes a long way toward giving the team one less thing to be concerned about. Additionally notable at forward, Jacob Josefson carried over his play from Albany. Stefan Matteau looked like he belonged, skating hard and finishing checks. Also finishing his share of checks was Cam Janssen. Defensively, aside from a lapse that left Travis Hamonic wide open on the power play, the unit led by new captain Bryce Salvador was solid. Although my one qualm would have to be with the scratch of Adam Larsson. Larsson is more than ready and had been playing superbly for the last month plus at Albany. Perhaps he’ll slide in for either Andy Greene or Mark Fayne. Also impressing on the blue line were Anton Volchenkov and Henrik Tallinder, each registering a plus two rating and Tallinder also picked up a helper to boot. In net of course was Martin Brodeur and Brodeur looked as though he hadn’t missed a beat. Yielding just one goal on the penalty kill, Brodeur’s steady hand and 19 saves were reassuring, in a league where rust has not been uncommon among goalies who couldn’t find consistent work during the work stoppage. So after one game at least, the Devils have answered some of their pressing questions and were able to execute enough to find a way to win. Getting that initial production going forward will be important to churn out on a consistent basis.